Sometimes it’s nice to take it slow at the weekend and enjoy the slower pace of our new life with the wonderful scenery around us. Since we moved to the new house I’ve always been very conscious that I should be grateful for the combination of persistence, good timing and dumb luck which got us here. One of the real pleasures of living in this part of the North Pennines comes at the start and end of the day with great scenery in the morning and huge star filled skies at night. 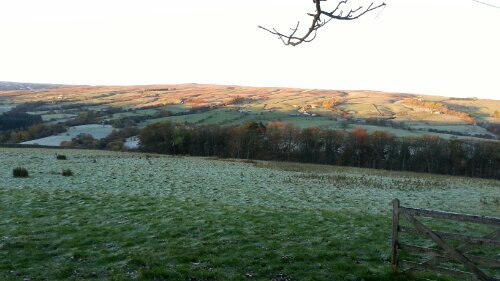 The frosty start this morning while feeding the pigs was a typical example especially the way the rising sun hits the fields on the opposite side of the valley. However this weekend was not one of those easy-going, relaxed weekends. Instead it was spent taking on a couple of important jobs which we had never tackled before so there was a certain amount of apprehension. In my experience there is only way to go when faced with that kind of problem and that is to tackle it straight on, just get on with it. 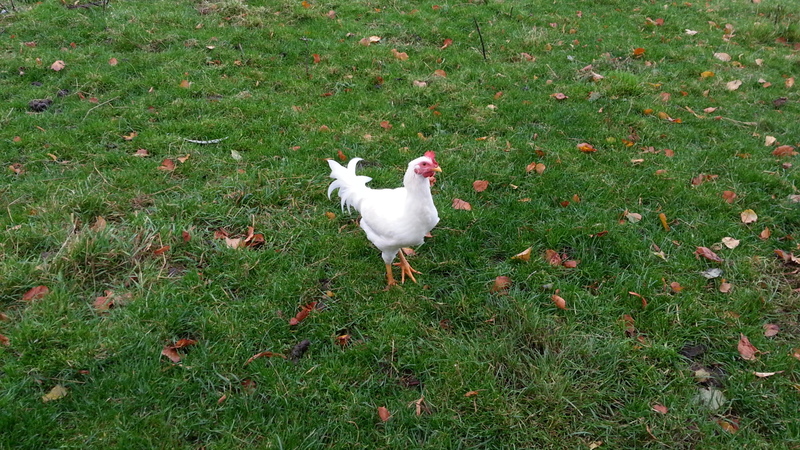 The biggest deal in my mind was the need to”rationalise” the chicken flock before any problems could arise. There are too many males after the eggs that hatched earlier this summer so some of them have to go. We finally got up the nerve and took the opportunity on Saturday to slaughter our first chicken. 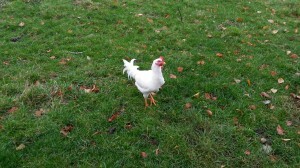 This one had been one of the eggs that a hen was found sitting on soon after we moved in. A great deal of internet research was done, many messages exchanged with helpful people on web forums and a number of slightly gory YouTube videos as well. In the end I decided on neck dislocation using a broomstick which seemed the most hands-on without actually having to look him in the eye while doing the deed. There was a little uncertainty after doing this so I also tried a manual neck dislocation just to be sure but I’m certain now that the first attempt was successful. On reflection I realise that it wasn’t anything like as difficult as I’d expected apart from the concern that we hadn’t done the job correctly. The biggest fear leading up to this was always that inexperience might mean a botched job but as it turned out this was unfounded. The feeling might have been different if the 2 remaining “pet” chickens were involved as a result of illness or injury but these white chickens were inherited from the previous owners when we moved in. They seem to be naturally flighty and want to avoid human contact so the sense of attachment is greatly reduced. On this first time we also decided against the full gore of plucking and gutting to help ease ourselves into the idea of raising chickens for meat. For this occasion we decided to pluck a little so we get the general idea but to just take the most accessible bits for eating. My first attempt at chicken dissection were nothing special but I managed to remove the breast meat and some of the thigh/leg as well. A generally successful first go at this with a little experience of each aspect but the next time we really need to take things a stage further – assuming we can bring ourselves to do this again of course! Over the weekend we also collected a shiny new Ifor Williams trailer which is just in time for some gentle practice (especially reversing!) before taking the pigs off the abattoir in a couple of weeks. Having never towed any kind of trailer before I was worried that my shiny new toy might not look so good by the time I got it home. It turns out that towing this trailer is no bother at all – in fact it’s no wider than a Subaru Forester and only slightly higher. When loaded with livestock the driving experience may be a little different of course but I’m much happier to know how it handles in general. The trailer might be considered to be a little too large for just 2 pigs who are making a one way trip of less than an hour. However I prefer to think that they deserve to go in style, especially as they have been such characters and absolutely no bother to look after for the last 4 months! I’ve already wondering what breed to get next year and hopefully after one more set of weaners next year I can swing it so that we get a couple of breeding sows for the longer term. There are many more things in the pipeline which will be covered by future blog posts in due course – fruit trees and bushes, broadleaf trees for the woods and of course like any keen veg grower I’m already making plans and shopping lists from seed catalogues!